Everyone takes a few minutes to think of all the games they already know. 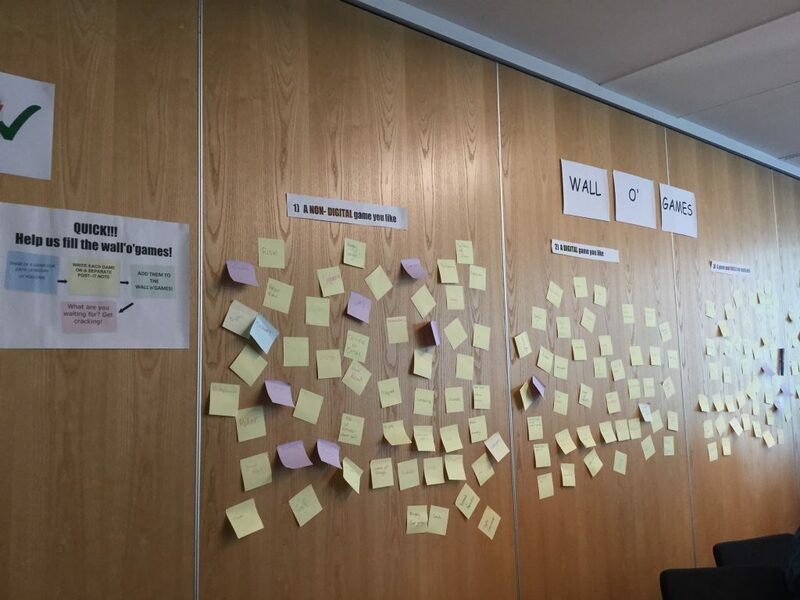 Each game goes onto a post-it note and up onto the wall. 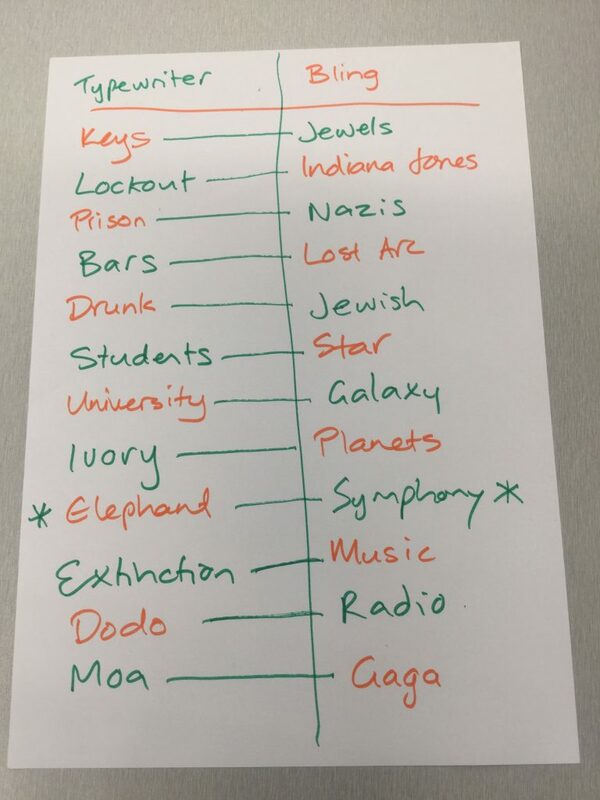 Try using categories that prompt people to think of different kinds of games. E.g. (Digital games, Tabletop game, Physical games), or set a fun challenge (e.g. think of at least one game for every letter of the alphabet). Don’t have any post-its? No problem. You can use a whiteboard, or a big sheet of paper. Within a few minutes, you’ll have a wall full of games, and your group will be marvelling over how many games they already know! 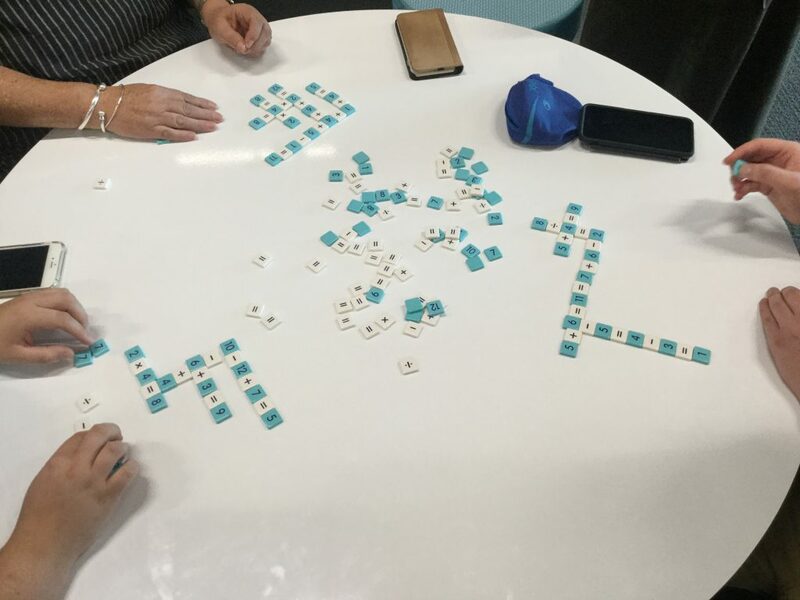 It’s a fun, fast process that often elicits lively conversation: “oh, I play that game too!” “Oh yes, I remember that one!” “I used to play that with my nana” “I love that game!” “Ugh I hate that game” “I played that heaps as a kid”. “Ooo have you ever heard of this game?” “That reminds me of another game…”. Etc. It draws out the people’s existing game knowledge and turns it into a shared resource. People (especially adults) often don’t realise how much they already know about games, until they step back and see the wall they’ve created. Pooling together the collective knowledge of the group and making it visible, turns it into a shared resource that belongs to the whole group. Used in conjunction with our Gameful Praxis “What’s in a Game?” cards, novice designers can start grabbing games off the wall, identifying and discuss different kinds of game genres, and the mechanics of how different kinds of games work. What if you crossed Scrabble with Pac Man? What if you crossed Jenga with Duck Duck Goose? What if you crossed Minecraft with Chess? 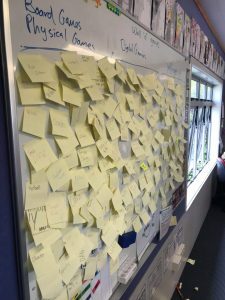 Read how Leanne has used this technique with her primary students here. The Wall’o’Games provides a way to step back and appreciate the diversity of game genres and mechanics that exist. It is only a short step to reflect empathetically on the types of games enjoyed by different people, and to start considering the extent to which the games that we play or know reflect diverse interests, experiences, play preferences, cultures, and identities. I hope you’re convinced! 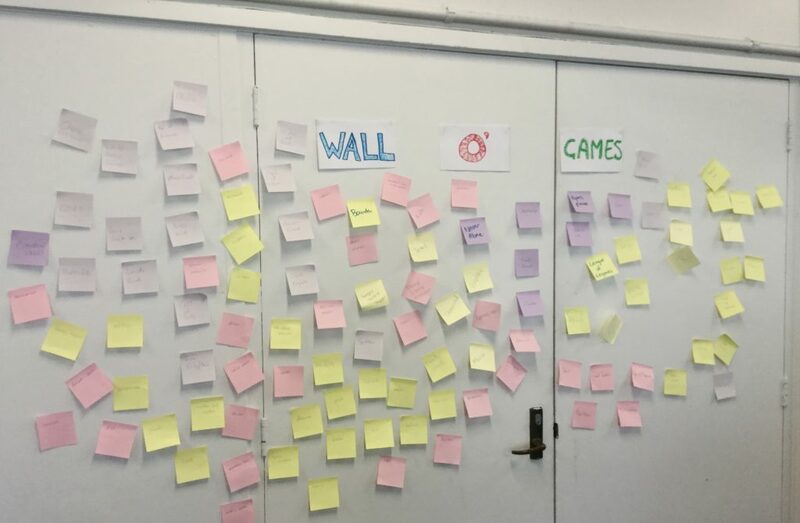 If you use the Wall’o’Games in your classroom or game design workshops, leave us a comment below – we’d love to hear from you. I heard words like this coming out of my mouth (with disturbing conviction!) at our most recent Meetup. 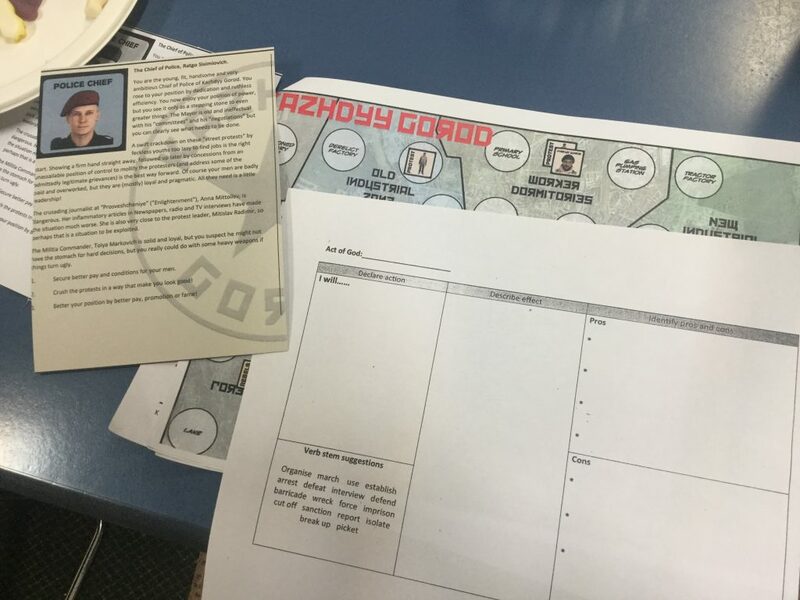 Thankfully, the purpose of the meetup was not to crush student protestors, but to learn about Matrix Games – of which KAZHDYY GOROD (designed by Tom Mouat) is an example. Our guest facilitators for the meetup were Andrew Savage and Michael Harcourt. Both are history educators who have collaborated in the use of non-digital games as a method to engage students with history’s complexity. 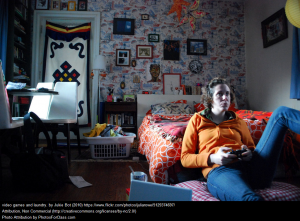 They have a particular interest in how games can generate debate, hone students’ argumentation skills and develop critical thinking when applied to historical contexts and contemporary conflicts. You can read more about their approaches in this case study, Playing for Peace, undertaken at Wellington High School in 2016. Andrew kicked off the meetup with a brief explanation of what Matrix Games are, and where they came from. As he explained, Matrix Games were invented by Chris Engle, an American psychiatric social worker. They were originally used as a technique for helping people work through personal relationship conflicts. The system was later turned towards the idea of simulating larger social and political conflicts. The game “system” is itself relatively simple, though it took all of us at least a full introductory round of gameplay to see how it works in action. 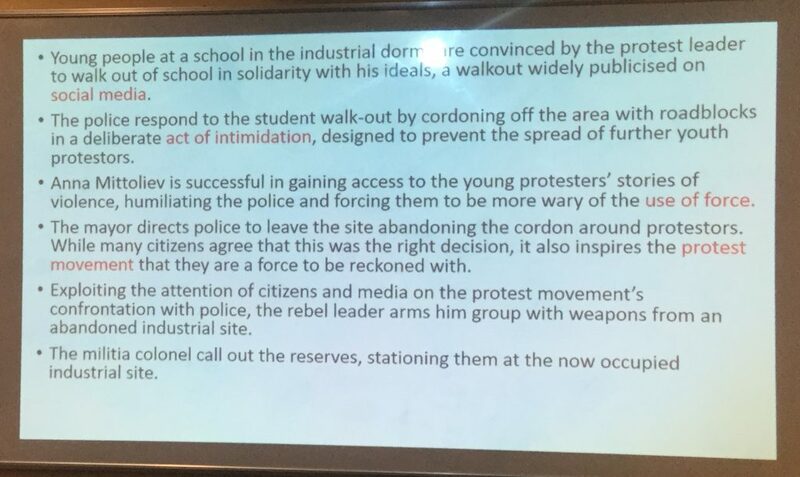 While I was playing the role of the police chief of KAZHDYY GOROD, other meetup participants took on the identities of other people in the city: a charismatic protest leader (the person who had inspired school students to walk out of school in solidarity), a journalist with sympathies for the cause, the city’s Mayor, an armed Militia, and the leader of a rebel faction. 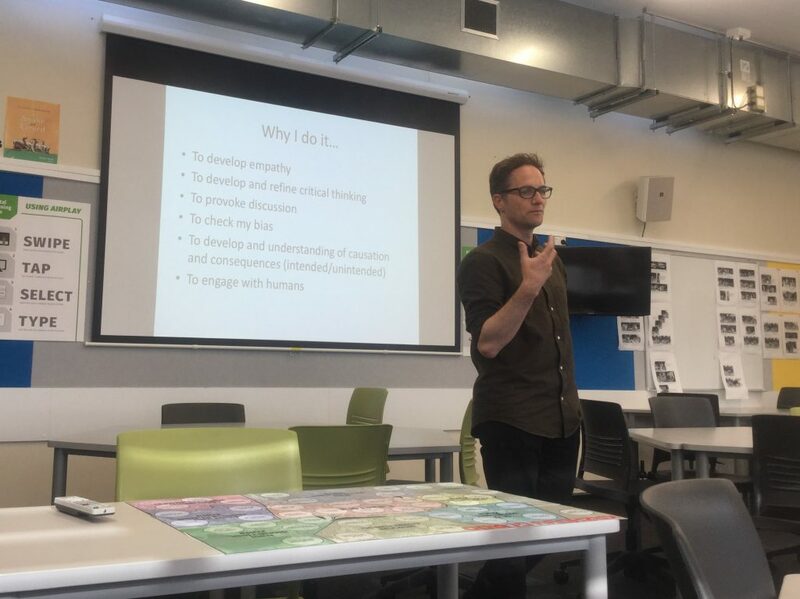 As we played, Andrew and Michael modelled how they use the game approach in the classroom, frequently questioning our ideas or challenging our suggested actions to provoke discussion. As each action “happened”, Michael added that information to the unfolding narrative (on a shared slide). They talked about the way the choices of wording used to describe “what happened” can be controversial, and how they had these kinds of conversations with students, building their understanding of the role of media, and how historical accounts may vary depending on whose perspectives those accounts were written from. The narrative record of actions played…but according to whom? Before we knew it, it was almost time to wrap up the meetup. 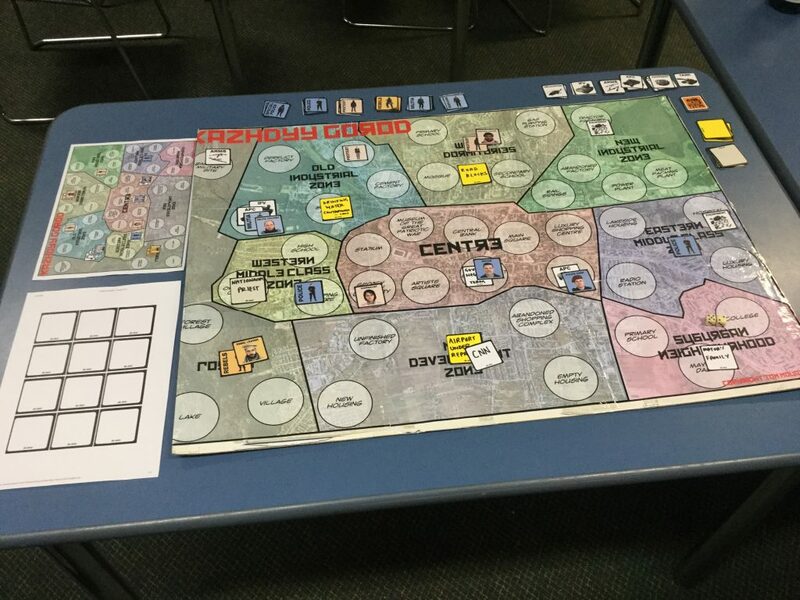 We had some interesting conversations about how other teachers might use Matrix Games like these with their students, and debated different ways the game could be set up, the ethical dilemmas that teachers and students grappled with when it came to using a game or simulator approach in the context of sensitive or controversial issues, whether students could run the game themselves, and the flexibility in the Matrix Game system – i.e. there are really no fixed rules, so you can make whatever rules or ways of playing you want. By the end of the meetup we were talking about what we could do if we had a whole day – or more – not only to learn about this system but to start hacking or designing our own versions of this approach for all sorts of different contexts, including primary classrooms, workplaces, or anywhere else that we might want to support critical thinking, the development of empathy and comfort with real-world complexity. 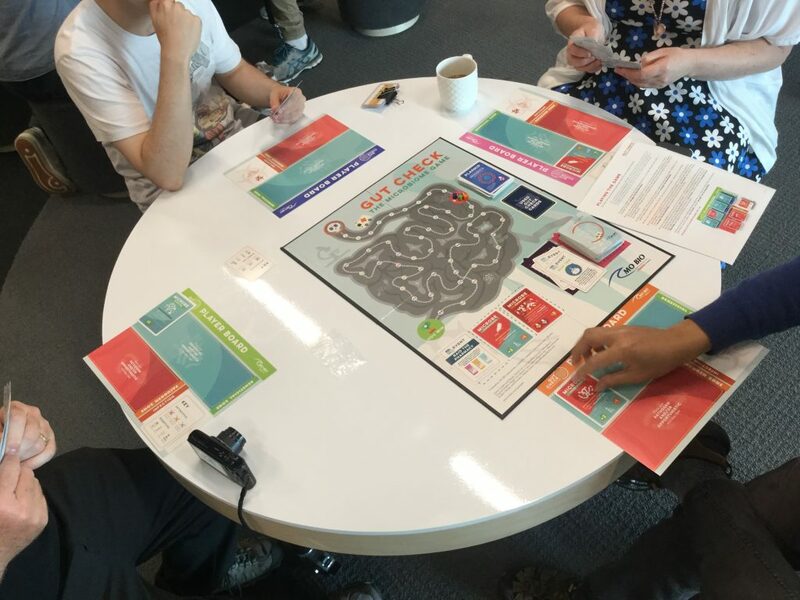 At least one primary teacher (Leanne, one of our Gameful Praxis co-founders) said she intends to hack this approach for her classroom, here’s hoping we can share more about that in a future blog post! 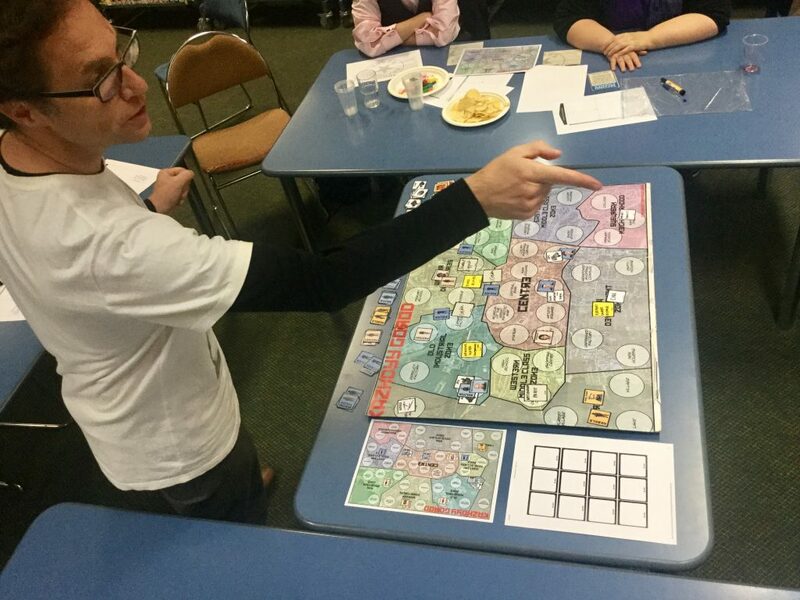 Are you interested in an extended session to learn about Matrix Games, even try designing and playtesting your own versions? We’re currently looking at options for setting up another session, possibly a full day, in Wellington later in the year. If you are keen to be involved please let us know by joining our Meetup group and sending us a message! 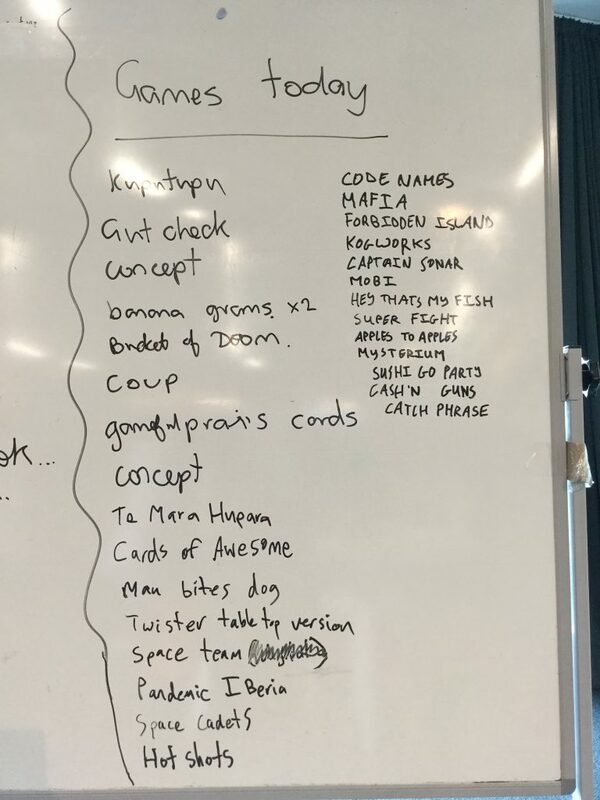 Almost a year ago the Gameful Praxis crew created our first prototype card deck called “What’s in a game?”. 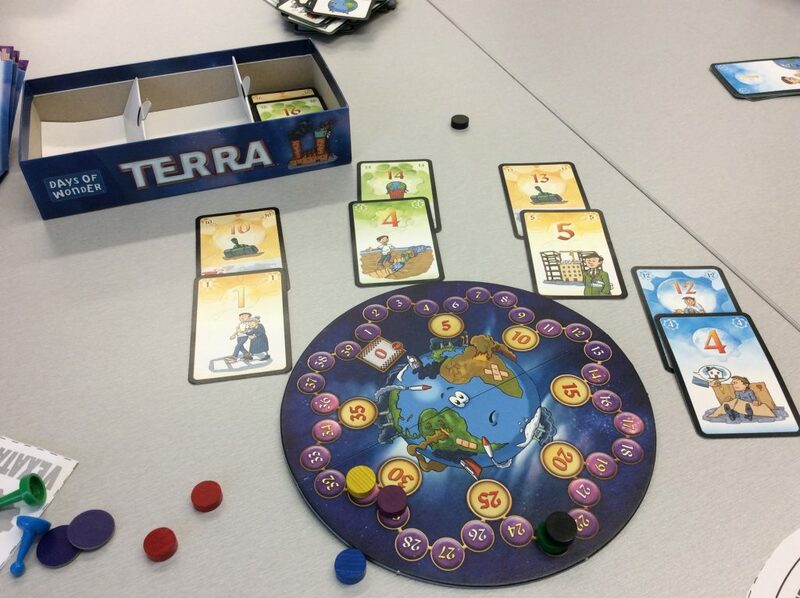 We’ve been using this deck in lots of our game design workshops, and we are happy to share it. Here’s the link to the downloadable pdf if you want to print out your own set! Here are some notes on what you can do with them. 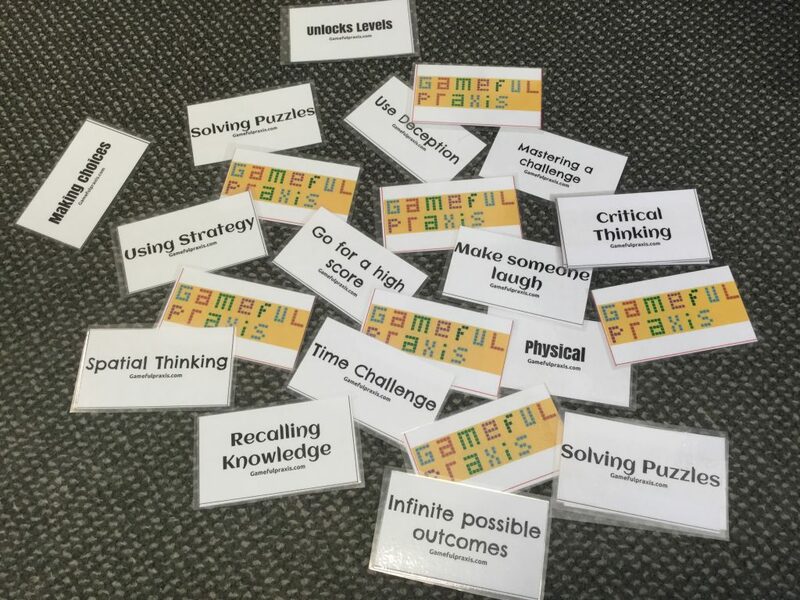 These are just a few suggestions to get you started and you may find lots of other creative ways to use them to stimulate thinking, discussion, and design relating to games. 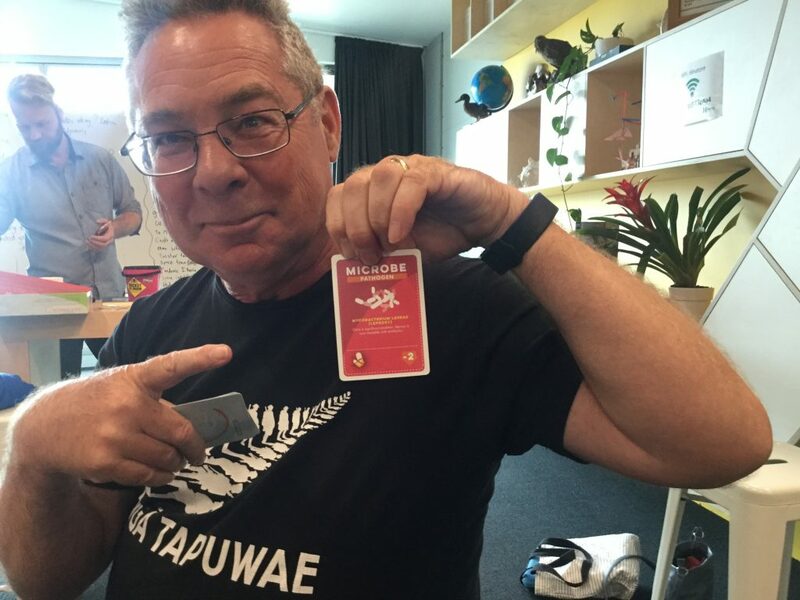 The deck was invented in my living room one weekend in 2016 as Leanne, Diana-Grace, Dan, and I were planning for a half-day workshop we were going to be running with teachers at the ULearn conference. The workshop was an iteration on a process that Dan and I had developed and run for the first time in 2015. 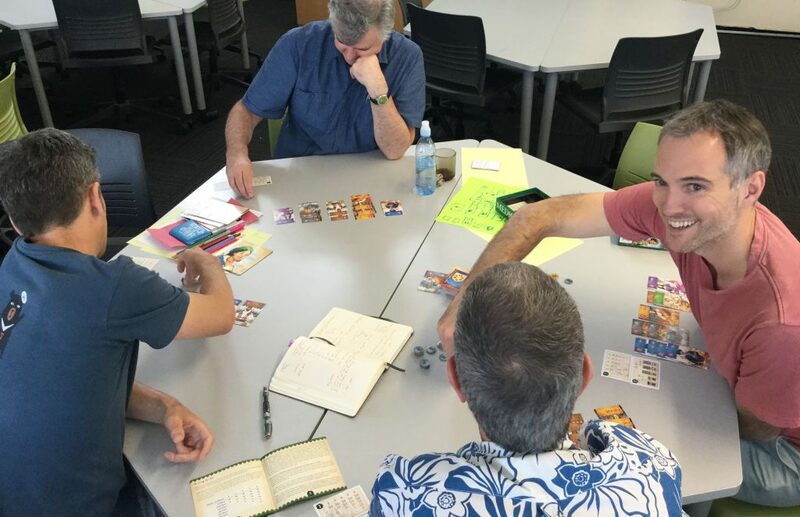 The workshop was (and still is) designed to inspire teachers to dip their toes into thinking like a game designer, and seeing how game design thinking and processes can be relevant for the classroom curriculum. It seemed to have gone pretty well the first time around in 2015. 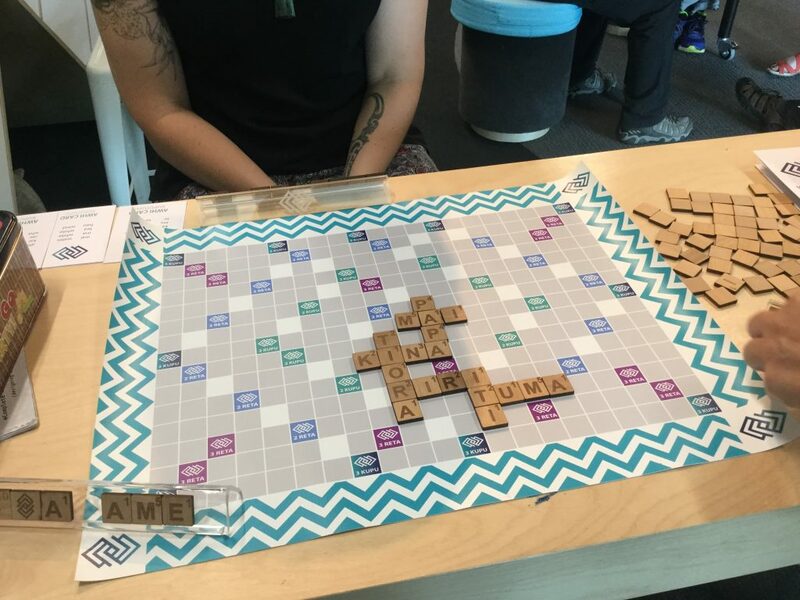 We were especially excited that we’d inspired Leanne, one of the workshop participants, to take the game design process back into her classroom the following week with exciting results. Even better, Leanne was now part of our Gameful Praxis team and, along with Diana-Grace, would be co-facilitating the workshop with us. With new facilitators in the mix, it was time to update and refresh the workshop and think about how to make it even better. Like good game designers, we were reflecting on what had worked well in the first workshop, and what could be improved in our next iteration. 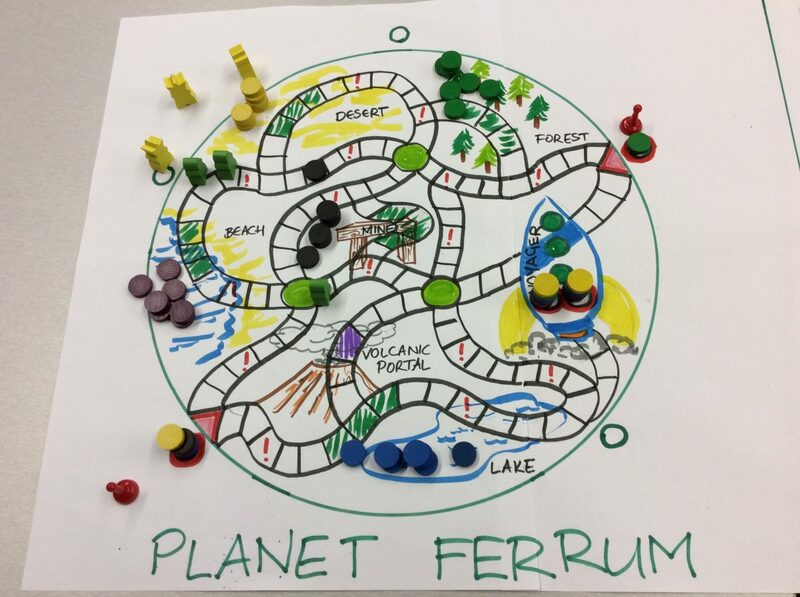 At the core of the workshop is a group-based design challenge, where participants are supported to “gamestorm” a concept for a game for a particular “client”, and then at the end of the session pitch their game idea to the room for some rapid feedback and suggestions for improvement. In getting to the game idea and concept, we support participants to unpack what they already know (and sometimes don’t even realise they know) about games, and to pick apart how different features and attributes of games can be used to design engaging and powerful learning opportunities and experiences for their imaginary “client”. 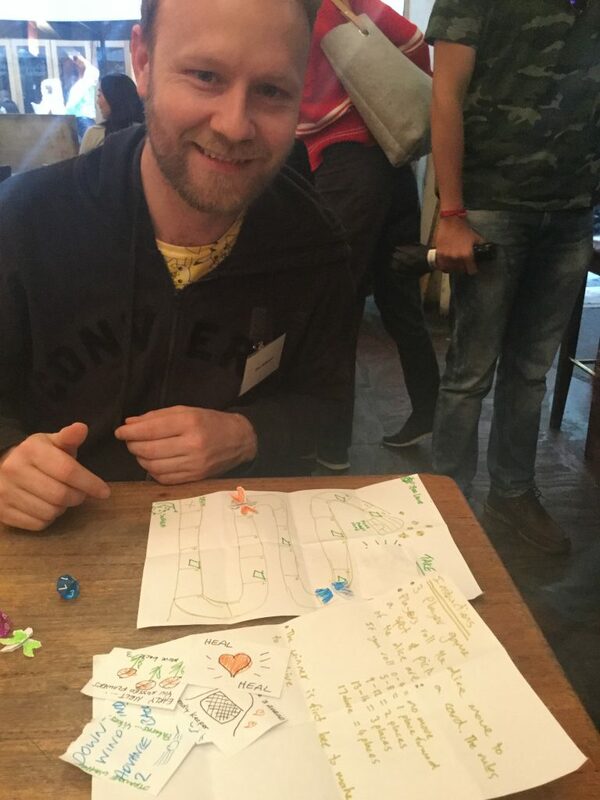 In the early days of the workshop, we noticed some participants seemed to struggle a bit in the part of the workshop where we were starting to explore different game mechanics and think about what kind of game (or game features) they could incorporate into their own concept design. We’d tried using a very well-known game design card deck, Jesse Schell’s Art of Game Design 100 lenses. This is a fantastic resource that helps game designers to consider various ways to tweak, improve, and enhance their game design. But the deck proved to be a little bit too advanced for people who might be taking their very first steps into game design. I get it. 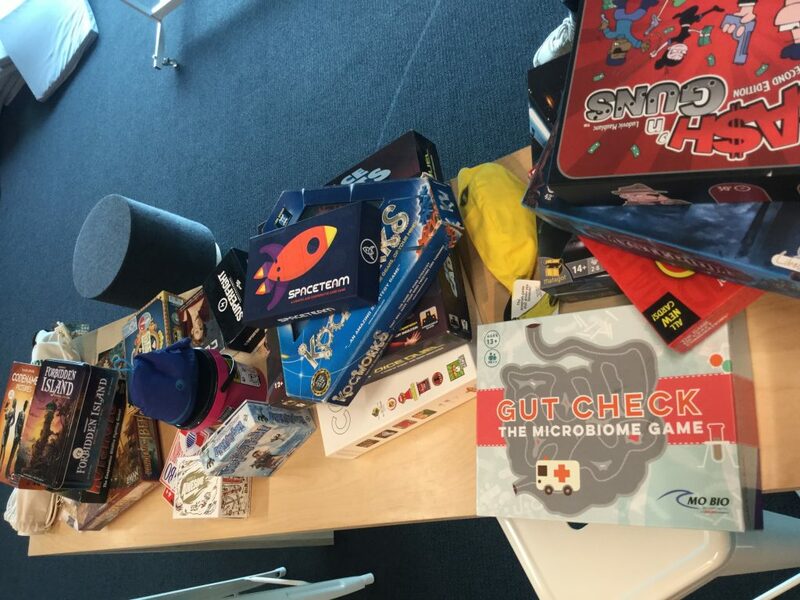 People in our workshops often feel like they don’t really know much about games (even though we as facilitators know that they actually probably know much more about games than they realise!). I’ve asked lots of rooms full of educators to raise their hands if they consider themselves a gamer, and most of the time less than 10% raise their hand. I’ve asked those same groups if they know what it means when we talk about “game mechanics”. For many, this is an unfamiliar term. We needed an easier way to get people started in dissecting and unpacking the features of different kinds of games. This is how the “What’s in a game?” card deck was born. We wanted a simple, plain-language card deck that could help people quickly latch onto the huge breadth of possibilities that games can offer. The card deck contains 30 words or phrases that describe different things that different sorts of games can be and do in terms of the player’s experience. (You might notice that many of them could also apply to other media too such as books, films, and television). 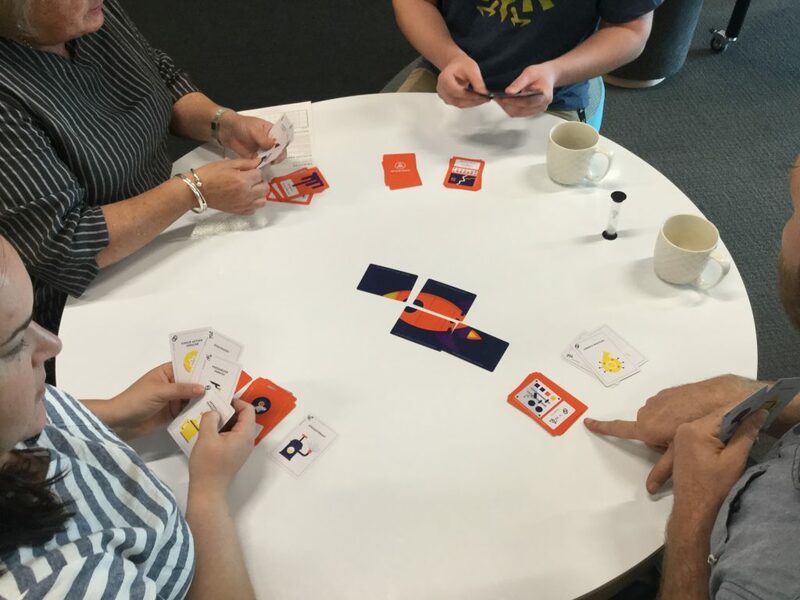 Without getting bogged down in the complexities of game mechanics, the cards help people to think about games they may already know, and to think about all the different sorts of experiences that various games can offer. 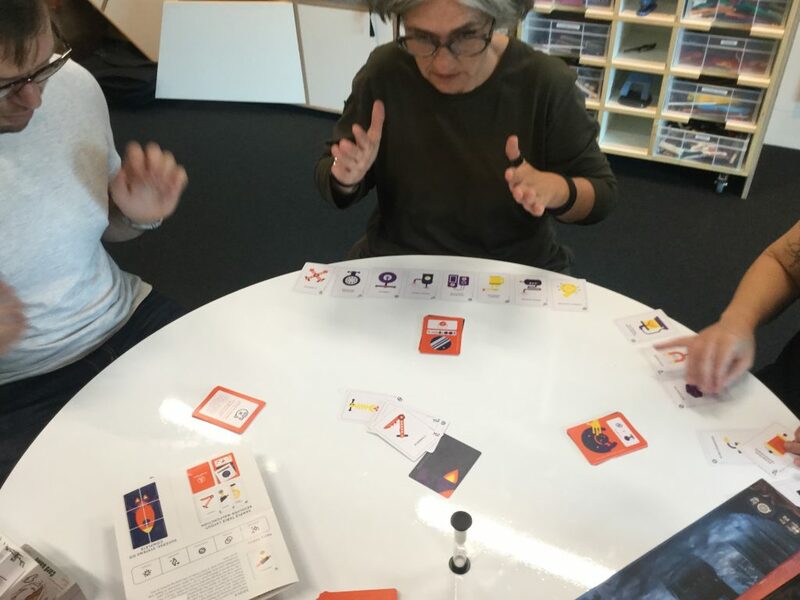 The cards can be used to play games – like “guess the game”, and they can be used to help in the design of games, as designers think about what kind of game experience they want their player to have. The cards are an optional part of our process, but I think they’re a really useful tool. We’re always exploring different ways to remix the process, including experimenting with different ways to use this card deck. 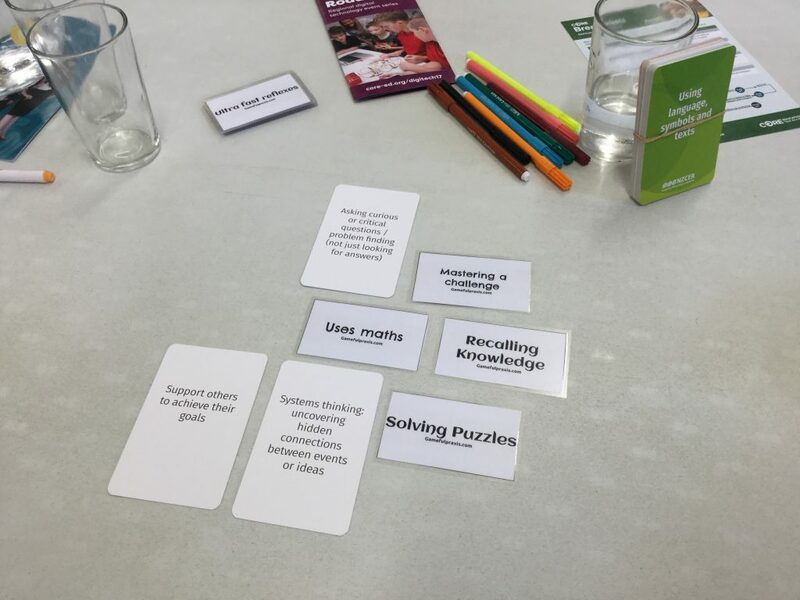 A few months ago I even had participants play with integrating these cards with NZCER’s new Key Competencies curriculum design deck. We’ve heard rumours that there are teachers and students out there riffing off the original deck and creating their own cards and ways to use them. We’d love to hear your ideas about how to continue to expand the usefulness of the “What’s In A Game” Cards! 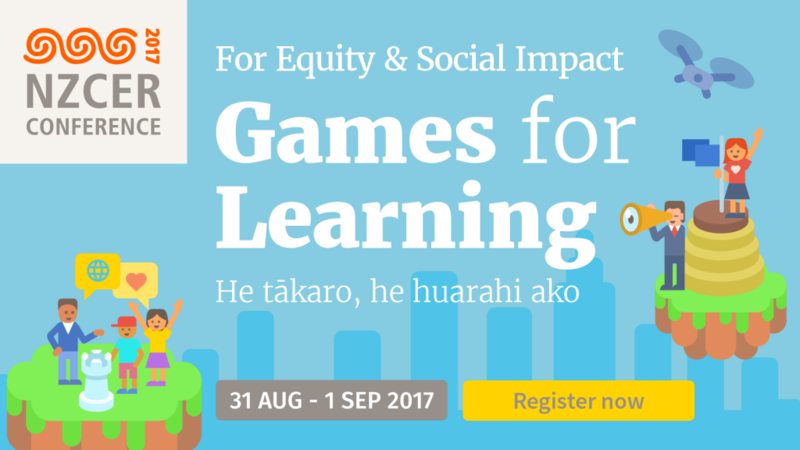 Come hang with the Gameful Praxis OG’s at the NZCER Games for Learning conference, at Te Papa, 31 August-1st September! There will be some fabulous featured talks and breakout sessions. My previous post discussed some of my personal highlights from the gaming mega-event PAX Australia. 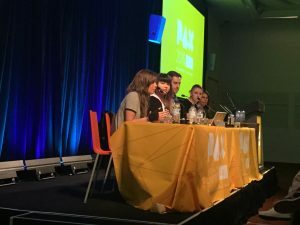 In this post, I’ll segue from PAX to the one-day Education in Games Summit that rounded off Melbourne International Games Week. As it turned out, education was the bridge between these two events. One of the final panel sessions at PAX was “Digital Games in the Classroom”, featuring a few faces that would pop up again the next day at the Education in Games Summit. 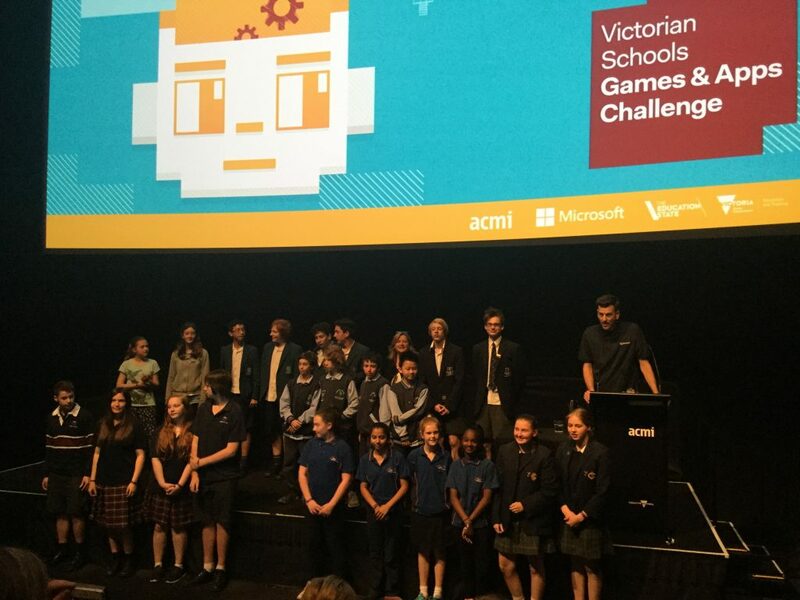 These included Professor Kurt Squire, two young student game developers Anvitha Vijay and Benjamin Sampson, and moderator Steffen P Walz, alongside Christine Evely (ACMI), Nick Hagger (Robot Circus), Kate Cooper (Clifton Hill Primary School) and Paula Christopherson, a Curriculum Manager at the Victoria Curriculum and Assessment Authority. I didn’t take many notes during this session, but there was lots of vigorous nodding, and prodding Dan at key moments to say “Look! They’re saying exactly what we’ve been talking about!”. We were especially impressed by Paula’s impassioned discussion of intentions of the Victorian Digital Technologies curriculum, and the general tone of the panel’s discussions, which underscored – from multiple perspectives – how well game design and game culture can align with the intention for empowering young people to become confident creators, rather than simply consumers of digital technology. There were also a few moments of interesting audience interaction. 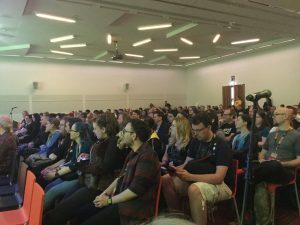 At one point, people from the audience mentioned games that had been particularly affecting for their own learning or perspective on the world. Later, a teacher asked for advice about how to approach digital games in the classroom if the games her students liked were inappropriate in the classroom due to their adult rating. Panellists and other audience members were eager to chip in, and the fact that all these discussions could have gone on much longer was a good sign. At the end of the session, there was much milling about in conversation. The PAX organisers were literally switching the lights on and off in an effort to herd us all out the door. And so, to dinner! Our dinner group exemplifies that “small-world network” thing that happens when you’re in a slightly out-of-mainstream field. Joining Bron, Dan, me, Kurt, and Marianne was Ivan Davies from Riot Games, who’s been doing very interesting work to support the development of young people’s positive sportsmanship behaviours in competitive online gaming. We’d been talking on the phone over more than a year and finally got to meet in person at PAX, and it was his bright idea to all go out for dinner. 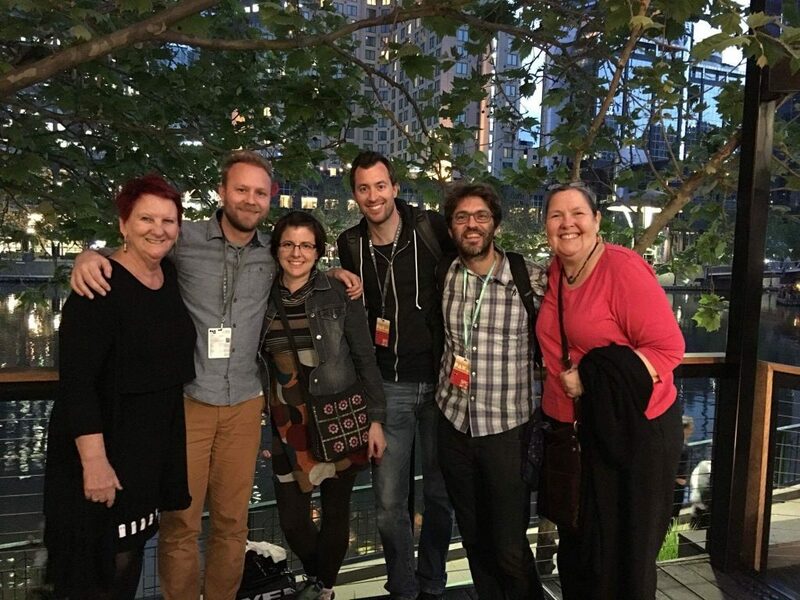 The six of us currently live on three different continents, and we’ve variously met through Twitter, or at other games in education conferences, or through each other. What this shows, I guess, is that people who are interested in games in education want to find and connect with each other. Whether you’re a teacher, a researcher, a game developer, a tech developer, or a community developer, or something else, if you’re interested in games in education, there are other people out there who will be interested in what you’re doing, and will want to help. 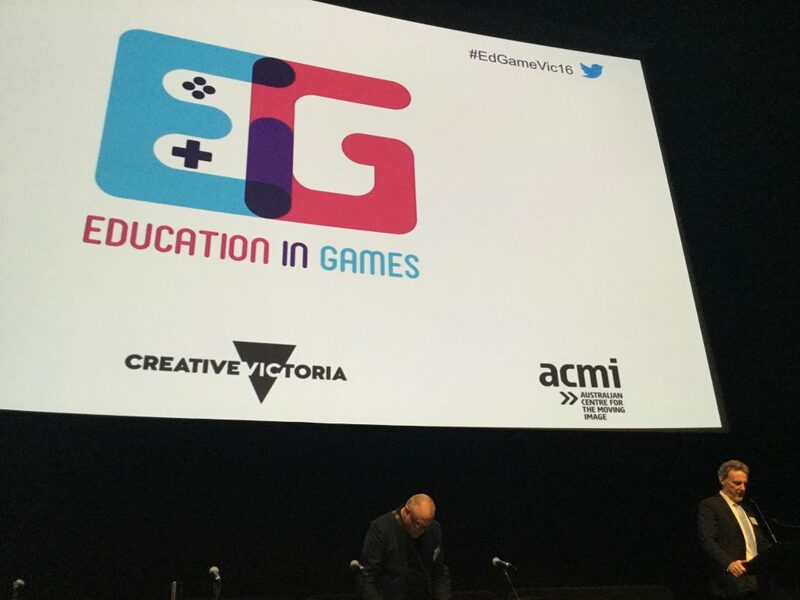 The next morning the Education in Games Summit kicked off at The Australian Centre for the Moving Image (ACMI). My note-taking was a bit hit-and-miss and I couldn’t go to every session, but if you’re curious you can check out the full programme here. Highlights from the morning included Kurt Squire’s keynote, which illustrated ways that games can provide a means for engaging kids in being active, productive participants in society, including learning how to understand and take action on issues of local importance. He and his colleagues have done heaps of great work in this area – you can get a sense of it from the Games, Learning, and Society website. I’ve followed their work for a while so was familiar with some of their projects and games, (for example, Citizen Science), but it was cool to learn about ARIS, “a user-friendly, open-source platform for creating and playing mobile games, tours and interactive stories”, which Kurt said had been used already to make 10,000 games. I immediately thought of some teachers in New Zealand that I reckon would be interested in exploring the potential for this to support a deep and rich place-based education approach. We also heard more from Anvitha and Benjamin. It was great to see young people as speakers, rather than being spoken about, which is more often the norm at education conferences. Both presented confidently and candidly about their own self-directed learning journey towards becoming exceptional young game developers, and in Ben’s case, the creator of a game-sharing platform. They also did a good job of fielding audience questions, including a slightly awkward question about how “normal” they were compared with their peers. I think everyone recognised that these two young developers were particularly confident, capable, and focussed, so perhaps what the questioner was trying to get at was whether or their opportunities and drive to follow their passion and interest/talents could were as readily available to other young people. This is a good question and an important one, especially in terms of equity: Are all young people in a position to discover and develop their interests and talents in the digital domain, or are there existing inequities of access, support, or opportunity that we need to address in order to make this possible? This question isn’t necessarily one for Anvitha or Ben to answer, but they did have some great advice for teachers on how and why to support students to learn through coding and game design. Later in the morning Vicent Trundle from ACMI talked about their GamesNet programme , an interesting little project that gives gifted and talented students across Victoria to collaborate online and in person to produce their own videogames, working in teams and with support from industry mentors. He also discussed more generally thoughts on the importance of developing “a healthy game literate student and school community”. This was followed by another panel session on “The future of games in the curriculum”. After lunch I attended two great talks by two of the panellists. The first by Rebecca Spink, an assistant principal at Aitken Creek Primary School, and creator of a non-profit organisation called Code the Future which connects developers with educators to help students learn how to code, and the second by Narissa Leung, principal of Campbells Creek and Guildford Primary Schools. Both told rich practice stories of game design in their primary schools, with the added bonus of being thoroughly grounded in learning theory. I was madly tweeting from this session, tagging Leanne and dg back in Wellington every minute or so. (Leanne later informed me it was perhaps a little too much, but I didn’t want them to miss out on the great stuff their Australian counterparts were saying and doing). While I was at these talks, Dan, Marianne, and Ivan were at a “Make your own Game Jam” session, first getting some advice and tips from Giselle Rosman, the executive producer of Global Game Jam, and then actually doing a rapid-fire game jam with teacher/developer Paul Taylor. 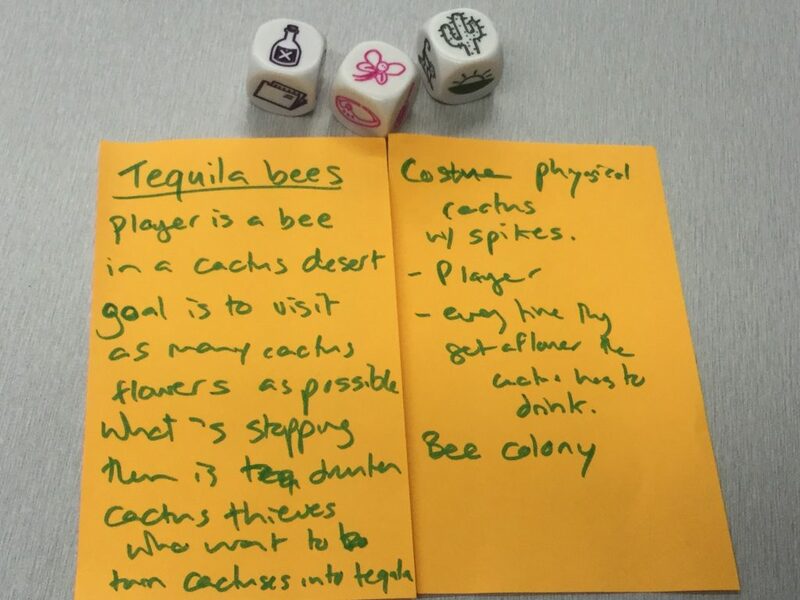 Here’s the result – a playable boardgame, with a theme relate to climate change, called “I want to Bee Leave”. I missed some of the afternoon talks due to the need for a fresh air/mental processing break, but returned in time for another student showcase – the finalists in the Victorian Schools Apps and Games Challenge, followed by the closing keynote from Annabel Astbury, head of digital education at the Australian Broadcasting Corporation (ABC), on the potential and possibilities for VR in Education. The day finished up with some social mixing and mingling, which was a good chance to meet some of the people that I’d not met during the day, and to hear about some of the other sessions that I didn’t get to. Because there were three parallel sessions happening during the middle part of the day, it was impossible to see and do everything, but what I got from the day was certainly useful and inspiring. All in all, the trip across the ditch was very worthwhile, and it was great to meet and connect with some Australian colleagues. 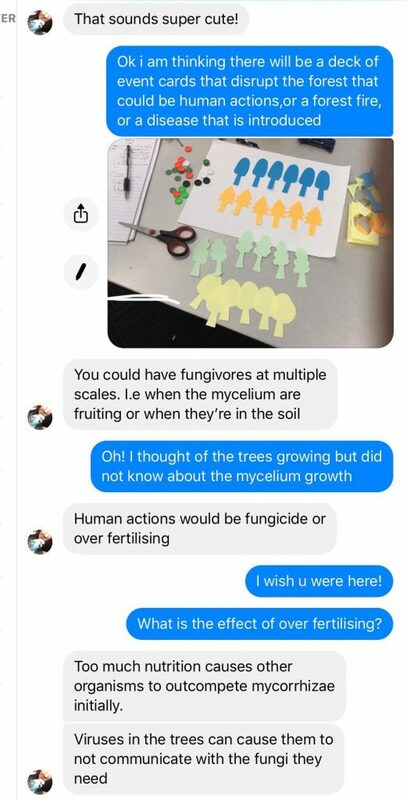 I hope that in future years we can develop and strengthen these connections! 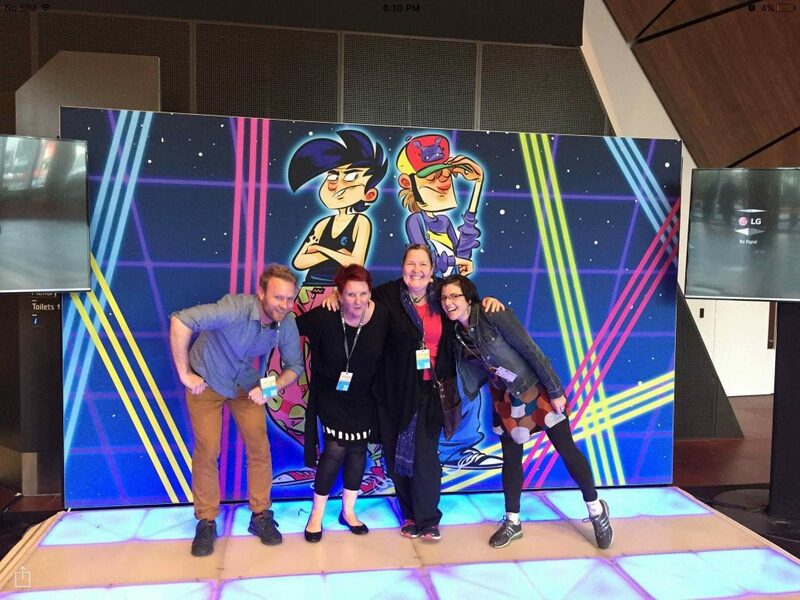 Earlier this month a small handful of us crossed the ditch to Melbourne to check out PAX Australia and the Education in Games Summit. I learned about the Summit via a Facebook post by Bron Stuckey (our friend and recent Gameful Praxis guest speaker). I was keen to attend, as were fellow Wellington Gameful Praxies* Dan Milward and Marianne Malmstrom. So, we made plans to meet up with Bron on her side of the big ditch commonly known as the Tasman Sea, for a long weekend of game-related learning and fun. 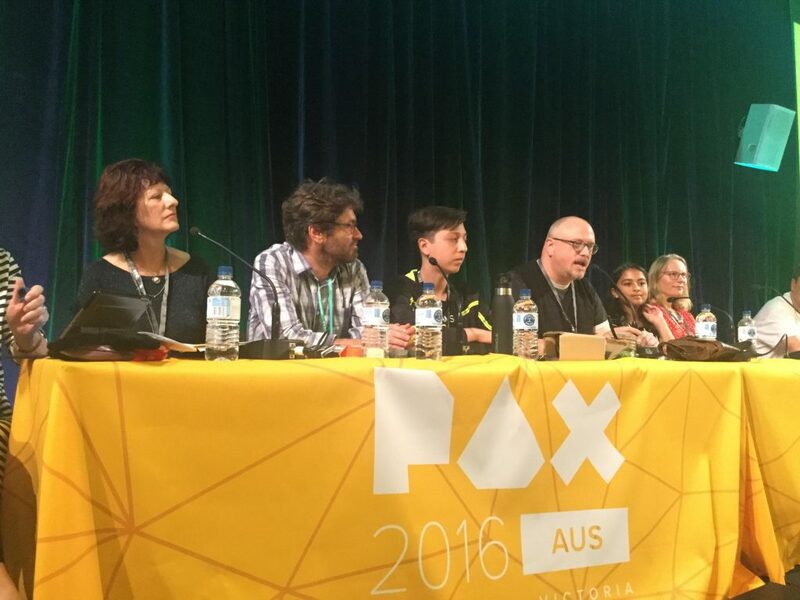 If you’re not in the games industry, you may not know that Games are kind of a big deal in Melbourne. In fact, there is an entire 10-day “week” devoted to it: Melbourne International Games Week (MIGW), billed as “Asia Pacific’s largest digital games platform for entertainment, serious games and gamification”. 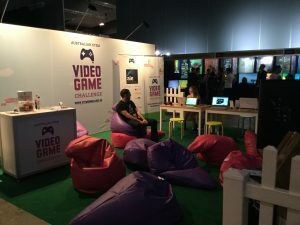 MIGW includes around a dozen different events, ranging from games industry conferences, to gamer-focussed exhibitions, gaming and coding workshops, and VR showcases, attracting over 60,000 people across the week. 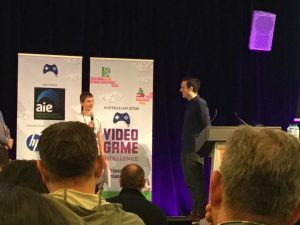 The Games in Education Summit was one of the last events of MIGW, falling on the Monday after one of the weekend events, PAX Australia, so we planned our trip so that we could catch both events. 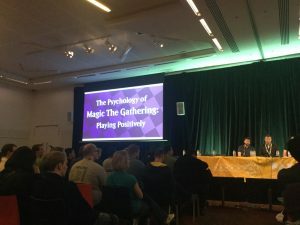 In this blog (part 1) I’ll talk about my experience of PAX Australia. My next post (part 2) will focus on the Education in Games Summit. To the disappointment of one of my gamergeek friends, I’d confessed that I didn’t entirely know what PAX Australia was before I went. Now I know it’s a huge, fun, very well-organised expo covering everything you could possibly be interested in related to games and gaming. I mostly attended a lot of very good panel discussions, and also spent a lot of time gawking at some incredibly creative Cosplay outfits, watching people inside hi-tech VR setups, and wandering the huge exhibition hall full of games and game-related activities of every genre where, on impulse, I bought an award-winningly nerdy tabletop game. If any of this sounds vaguely fun to you, I would definitely recommend checking out PAX next year! Here’s some highlights from some of panel sessions I went to, and what my main takeaways were in terms of gameful praxis…..
I’ve been following this student design challenge with interest over the last few years, so it was great to be there to see and hear from some of this year’s winning student groups. Most of the students explained that they had worked in teams to build their games, divvying up roles including visual design, coding, sound design, and play-testing/quality control, although a few students created their games as a solo project. Most teams said making their games was pretty hard, and took 2-3 months of work. I later had a chance to play some of the games, and was impressed with how well-executed and playable they were. 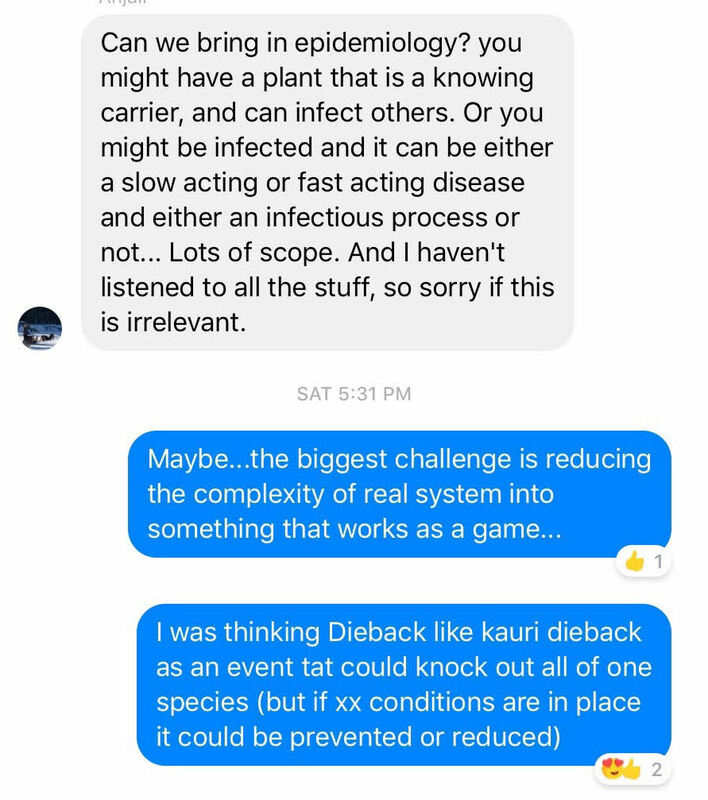 One of the game concepts that really grabbed my inner science nerd was Superbug: “Playing as the last trace of a virus inside the human body, fighting to survive against the combative practices of the immune system, players must collect DNA to strengthen themselves and hold out for as long as possible against an increasing array of enemies.” This struck me as a fantastic idea for a game, and exactly the kind of thing that might get more science educators excited about the potential of student game design as a means for diving deep into rich science content. I went to a couple of different sessions about the value and importance of diversity in games and gaming, and another one about surviving online harassment. If I could sum up the one big idea that threaded across all these sessions, it is that the games and gaming world is a microcosm where we find all of the same major social and ideological tensions we encounter in our wider social worlds. Panellists talked about the challenges of ensuring that the games industry encourages and fosters diversity of all kinds, for at least two big reasons. First, so that players will have greater opportunities to encounter games that reflect aspects of their own identities and experiences, and second, because diverse games can give players a window into the identities and experiences of other people different to them. The value of diversity as a strength and a resource came up a lot. 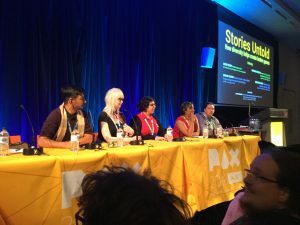 Panellists pointed out that the greater the diversity of people making games, the more varied, creative, and diverse games will be, telling many different kinds of stories, and so on. Game characters and stories that emerge out of diverse life experiences and worldviews create fantastic opportunities for cultivating player empathy – seeing the world through different eyes, just as films and books and television can do. I think these are all strong messages for us as educators to tap into in our work around supporting young people in games and gaming. 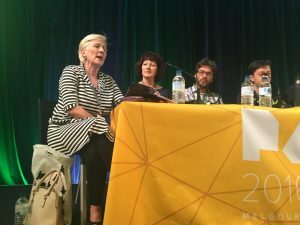 As an educational researcher who has inexplicably gravitated into games, I was drawn to this panel session of people who came from all sorts of different careers and backgrounds and landed up in the games industry, from a nightclub bouncer, to a geneticist, to a primary school teacher. Each panellist had an interesting story, and reflected on how aspects of their previous lives transferred into their game design lives. The take-home message I scribbled down was something one of them said: “there is no such thing as a useless skill in the game design industry”. By this they meant that game design draws on so many different kinds of knowledge, skills, and capabilities, that almost any prior learning or life experience that helps to shape you into a more interesting, creative, organised, social, reflective, hard-working, time-managing, persistent, empathetic human being is going to serve you well in the game design world. Conversely, game design work generates so many opportunities to learn so many different things that are transferable into other aspects of life and work. 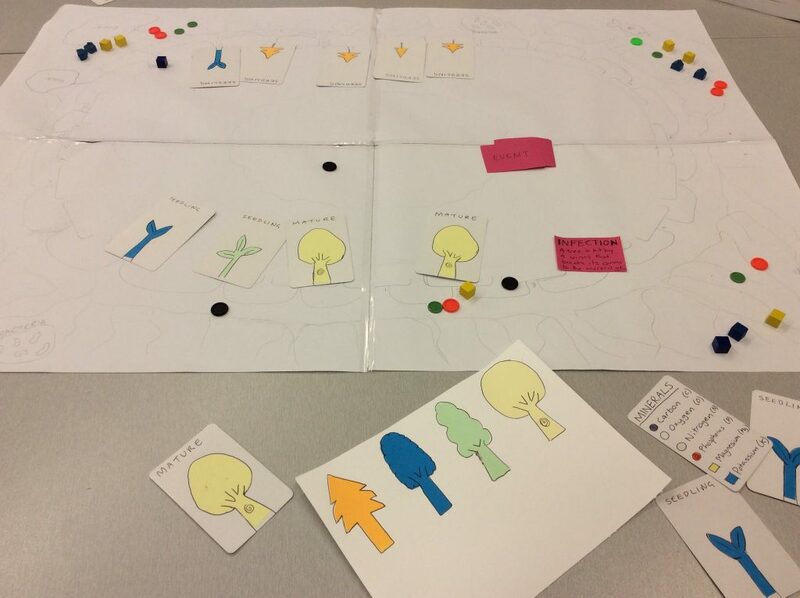 This is a message that we have been trying to emphasise in our Gameful Praxis work too – there is just so much learning possible through game design. That being the case, how do we as educators help to ensure the learning is relevant, useful, transferable, and meaningful? Wow. I think this was possibly my favourite session in the whole of PAX, even though I was probably the only person in the room who wasn’t a player of this hugely popular card trading game. The panellists provided a fascinating analysis of what it is that draws players to the game, and specifically, how the game manages to appeal to different players by tapping into a whole lot of different player motivations and providing a whole bunch of different ways of creating your own game experience. My take home from this session was to ponder the genius (and possibly slightly scariness) of a game that essentially says to the player’s brain “I can be the game you want me to be”. 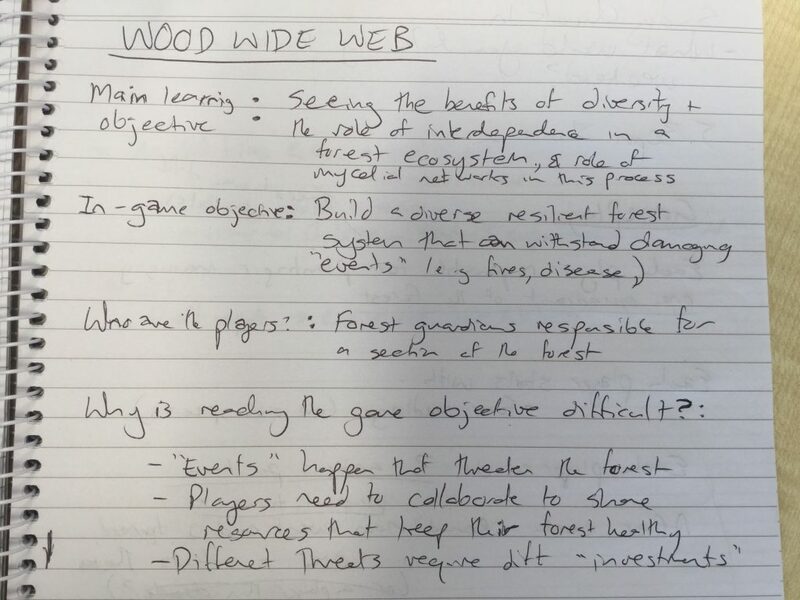 I took copious notes from this session…If you want to know more, come to our next Gameful Praxis meetup in Wellington on November 26th and ask me about it! *What should we call people who are part of Gameful Praxis? Technically we are probably “gameful practitioners”, but Dan has been calling us “Praxies”, which has a more fun and pixie-like ring to it. What do you think? Our first meetup! 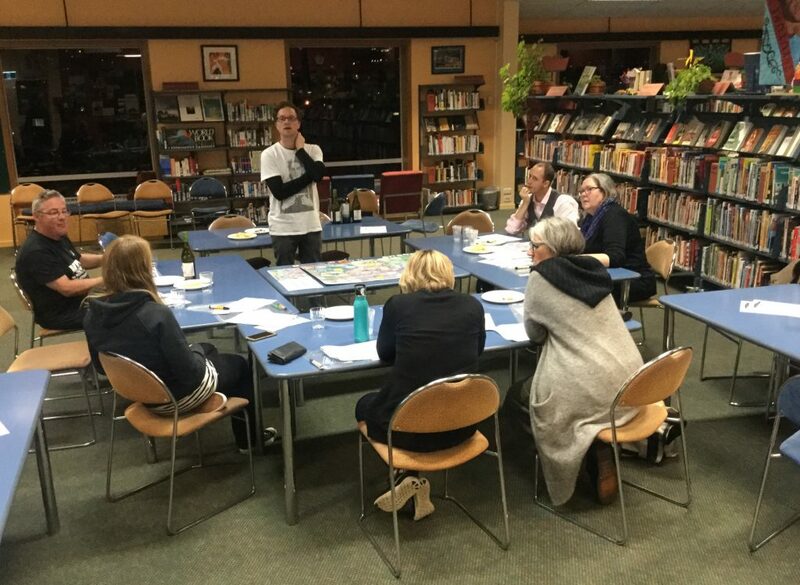 Hazel Bradshaw from the new Te Papa Learning Lab gave us an update and our guest speaker Bron Stuckey got us thinking about games and game design. Dan and Dave from Gamefroot took over in the afternoon to show the potential of this platform for students to design their own games. Podcast Review: Games are good for you! Quite often gaming is looked at in a negative way so it is refreshing to hear research that frames gaming in a more positive way. This particular episode is an interview with Jane McGonigal a researcher at the Institute for the future. Yes this is a real place and yes I want to go there! Jane’s research focuses on the neurochemical changes that happen when we are playing and how we can better understand how our brain works when we are playing. How can we “hack” this experience and apply it to our real lives in those moments when we need more resilience? 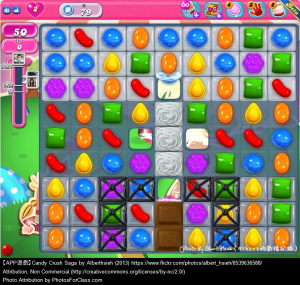 Candy crush saga, Bejewelled, Solitaire… you know those games that you just play that don’t seem to be of any value yet you spend hours playing while you take a break from reality? Are they actually valuable then? Well, when we are able to stop thinking about things that are bothering us and take a break from reality we are incorporating techniques from both cognitive behavioural therapy and meditation. I interpret that as gaming as meditation, gaming as a healthy way of disassociating. I can hear your brain right now crafting an argument against this and that’s cool because this is all sounding way too good right? McGonigal also did a metastudy of 500 pieces of research about gaming and wellness. Half of those found negative correlations, half positive. The key to positive outcomes was the ability to relate game play to reality in a meaningful way. If you were unable to do this games became an escape from reality, a downward spiral. Life gets worse, play more games = unhealthy outcomes. Unfortunately this is the picture of gaming that is painted in the media, and is on the mind of parents of teenagers. That is not to say that this negative image doesn’t exist, it’s just really hard to break when you are someone like me trying to use games and game design in education in a positive way. McGonigal has found research that supports the idea that escapism games are okay for us in short bursts. 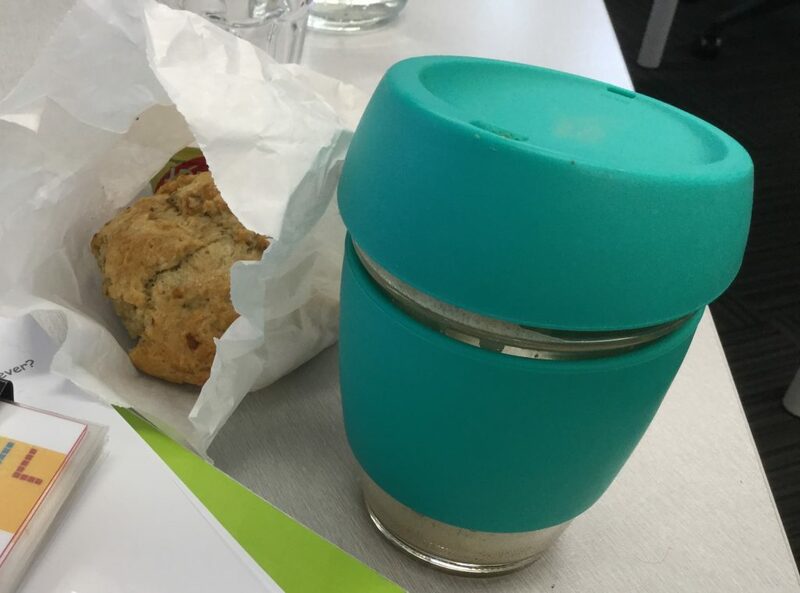 They can even help us break habits like sneaky snacking (I am actually keen to try this one and am tempted to put a post it note on the packet of biscuits saying “play a game instead”). She also points out that self-regulation is optimal, play the game to help you but know when you’ve had enough. Choose the game and see what it does for you. Jane actually designed her own game to help her through a bad case of concussion. Be interested in what dispositions they can transfer into their real life. If a child can talk about these abstract ideas then they have made that link, if they are referring only to things that exist within the game then they need us to help them bridge that gap. The last question that Jane McGonigal was asked in this interview related to games and addiction. Addiction as a “thing” is currently being challenged in the science world and the latest research is saying that addiction is a goal orientated action that gets stuck on one particular thing. With gaming the person needs to transfer those things that give them that “buzz” into other activities so that they don’t get stuck with that one thing that gets them feeling like that. That makes me sense to me. Perhaps we need to be more aware of how we can shift children and teenagers especially towards other similar stimuli? There are so many games out there that challenge people and build on skills needed in the real world. When you play online with and against your friends there are also many benefits. A good game has transferable skills. Games can be good for you but ultimately it is you, the player that needs to make decisions about what you play, why you play and how long you play for. Own your gaming and make it part of your life not an escape from it!